On behalf of Canadian Feed The Children, I was invited to attend one of the consultation sessions held in May, 2014, during the three-day Saving Every Woman Every Child: Within Arm’s Reach Summit – a follow-up to the Prime Minister’s Muskoka Initiative of 2010, focused on maternal, newborn and child health (MNCH). The session was rich with learning and dialogue. Last Thursday (February 5, 2015) CFTC’s Program Development Manager Genevieve Drouin and I were lucky enough to be in the room with more than 100 international development and political leaders at the Canadian Coalition for International Cooperation’s Leadership Forum. While there, the Honorable Christian Paradis, Minister of International Development and for La Francophonie, announced the outcome of last summer’s meetings: the Civil Society Partnership Policy. This policy marks a significant positive turn in the relationship between INGOs and the Government of Canada following a lengthy period of division and distrust. • Save lives and alleviate suffering. In his speech at the Forum, Minister Paradis raised the issue that given the current amount of ODA (Overseas Development Assistance) from the Canadian government, there is need to increase the levels of ‘blended financing’ – i.e., financing from the government, private and public sectors – to increase funding available to address the global need outlined in the forthcoming Sustainable Development Goals (SDGs), and part of Canada’s commitment to MNCH. The SDGs are to be launched in September of this year to replace the Millennium Development Goals. Part of the policy implementation will be the development of a ministerial advisory council of five to seven representatives from civil society, the private sector, and academia, drawn from both traditional and new development partners. The council’s format is still to be developed, but will include an annual meeting to confirm we are keeping on track. This is good news, especially for CFTC which is a relatively new participant on the international development stage at this level. We have worked hard to raise our profile in Canada, focus on cross-sector collaboration, and increase our efforts to achieve a larger share of institutional funding – funding that has been in short supply of late. We are also listening and open to engaging in the conversation that is underway with respect to private-public-INGO partnerships and while we are aware of the possible pitfalls, we are also realists and appreciate the opportunities. The challenges we face in fighting poverty and improving the lives of women, children and men around the world are large ones; our appetite and capacity for innovation has to be equally as large. Passion, drive, values-driven leadership – and fun! 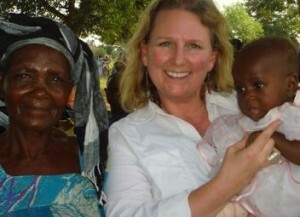 These words are only a start to describe Debra Kerby - Executive Director of Canadian Feed The Children. A values-driven leader who blends her international experience and an entrepreneurial spirit, Debra has travelled the globe pursuing education, building partnerships, and leading change and innovation in senior roles in both the private and non-profit sectors. You would be hard pressed to find a continent that Debra has not visited over the course of her career – although many of her destinations are definitely not on your average top 10 travel lists! An inspiring public speaker, she finds the world an amazing place full of opportunity and inspiration, and shares that spirit with others through writing and speaking engagements that leave people feeling as enthusiastic and optimistic as she is about changing the world one child, one family and one community at a time.